Tiger Cat is a small wild cat that inhabits the rain forests of Latin America. Leopardus Tigrinus, it is also named Oncilla, Little Spotted Cat, Tigrillo and Cunaguaro. It is said to have a close genetic and physical resemblance with Ocelot and Margay. About two feet long with a one and a half foot tail, it is longer than the domestic cat, yet it weighs less - in the range of five to ten pounds. Base color of the fur is tawny. There are many dark colored spots and blotches over its body and limbs. Underside of the body is light and generally lacks spots. Tail is ringed and tipped with black. Skull is small and narrow. Melanistic individuals are sometimes recorded, usually in dense forests where the dark coloration possibly aids in camouflage. 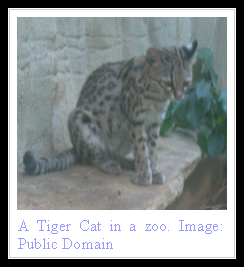 Tiger Cats living at higher altitudes generally have greater body markings than the lowland felines of the species. Solitary and nocturnal, the Tiger Cat is a good climber and often hunts birds. Mainstay though is a terrestrial lifestyle unlike the arboreal dwelling of the Margay. Insects, rodents and reptiles are commonly hunted. Gestational period is of two and a half months in case of Oncilla, after which two babies on average are born. Their development is slower in comparison to the domestic kittens. Life span is believed to be up to fifteen years. Tiger Cat is maintained in captivity in a number of South American and European Zoos even as it is under threat in the wild owing to deforestation and hunting for fur trade. It is currently classified as near threatened. This is a good tip particularly to those fresh to the blogosphere. Brief but very precise information… Many thanks for sharing this one. A must read post!